We had a fantastic master class with cellist Jonathan Byers on Saturday afternoon 23rd September 2017; Jonathan was the 1997 winner of the Northern Ireland Young Musician competition, and is now an internationally recognised professional musician. 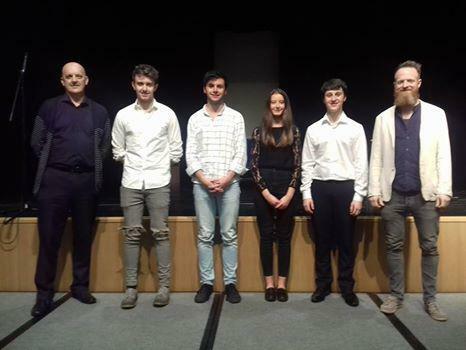 Four of this year's finalists were able to benefit from Jonathan's expertise: pictured with Jonathan and accompanist Michael Harrison are Gary Hunt, Conall Mc Hugh, Lucia Corrigan and Samuel Kane. Jonathan Byers has since expressed his joy at having been a part of the master class, and how exciting it was that they were all working so hard and making such great sounds - also that they were all able to immediately put into practice any advice given.